Fresh off of a five-game West coast road trip, the Washington Wizards returned home without the services of the All-Star point guard as John Wall sat with a sore right knee. Many fans thought Wall’s absence would be the ultimate, and fitting, dagger in the Wizards season but his teammates took care of business without him. Brooklyn was short staffed without Jarrett Jack, Brook Lopez and Thaddeus Young and it showed. Once the home team cleaned up some turnovers, possibly a result of Wall not running the show, the Wizards had their way with the nets. Although playoff odds are slim, Washington took care of business with a 121-103 victory. Washington seemed unphased by the loss of their leader to start the game as they opened things up with a quick 9-0 advantage with Bradley Beal and Otto Porter aggressively looking for their shot. By the midway point of the first quarter, Randy Wittman was forced to call timeout as the Nets went on an extended 17-8 run to tie things up. 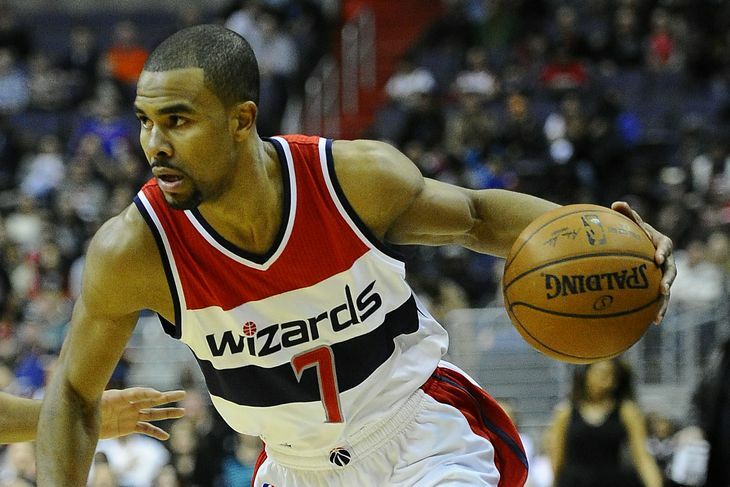 The home team would end the quarter on a 10-2 run as Ramon Sessions was looking to play himself into a nice contract with 7 points and five dimes in the first twelve minutes of play. DC got their free Egg McMuffin as the Wizards led 30-23 after one. 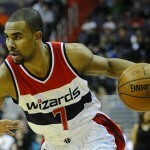 The Washington Wizards picked up a significant win over the Brooklyn Nets on the road on Saturday, 99-90. Washington (28-13) outscored the Nets by 12 over the final three quarters en route to the victory. After missing four games with right foot tendinitis, Nene returned to the Washington Wizards lineup in time to help the squad to a 113-107 win, snapping the Brooklyn Nets’ three-game winning streak Wednesday night. Nene posted 17 points off the bench and added three rebounds, but it was John Wall who powered much of the Wizards’ run with 21 points and six assists to help counter the season-high 27 points notched by Brooklyn’s Paul Pierce. Brook Lopez proved the first menace to the Wizards’ defense. Washington gifted Brooklyn’s center six free throws in the first quarter alone and he broke through with a jumper and two-point shot to keep the Nets within two, down 30-28, to start the second quarter. After a rather quiet start to the second quarter, Wall and Nene made their presence known with less than five minutes remaining in the half. Wall went back-to-back with a layup and 25-footer to make it 50-43 Washington and Nene added another six points in a grand total of 45 seconds via a jumper, layup and two free throws. Needless to say, the Wizards nearly carried a 10-point lead to halftime, but Lopez’s final basket of the half made it 59-53 Wizards. Washington held Brooklyn at bay in the third quarter but gained momentum on Nene’s driving dunk, which helped take the Wizards to an 85-77 lead into the final 12 minutes of basketball. Pierce and Lopez did their best to ignite Brooklyn’s offense, but a driving dunk by Wall and a host of made free throws kept the Nets out of reach. All told, the Wizards went 25-for-30 on free throws, compared to Brooklyn’s 20-for-24. They also created their own opportunities by recording 51 rebounds, compared to the Nets’ 31. With the win, the Wizards are 5-8 in away games, which brings the team just just two victories away from matching last season’s total road wins. In 2012-2013, Washington went 7-34 on the road. At the start of Friday night’s matchup against the Brooklyn Nets, the Washington Wizards appeared headed for a 1-4 start entering into a three-game road stretch. That is, until a second-half surge and timely production from Nene and Trevor Ariza lifted the Wiz Kids to a less-than-likely 112-108 overtime win over Jason Kidd’s Nets. Trailing 99-97 with nine seconds left in the fourth quarter, Brooklyn’s Kevin Garnett laid down a block on John Wall before the Wizards nabbed the rebound. Wall tried once more with a missed layup before Nene sank the putback to send the game into overtime. But the shot accounted for just two of his 12 total points tallied in the quarter and, without all of them, the Wizards would have stood little chance against Brooklyn’s all-star cast of players. The Washington Wizards rallied after trailing by as many as 13 points deep into the third quarter, but they did so only to fall in overtime, 111-106, to the Brooklyn Nets. Nene and John Wall led the Wizards’ efforts with 19 and 16 points, respectively, but Brooklyn head coach Jason Kidd allowed the Nets’ newest additions plenty of time to show their stuff against a Washington team determined to erase memories of last season’s disappointments. In efforts to make up for Emeka Okafor’s absence, Jan Vesely led Washington with 12 rebounds on the day, although he did tally twice as many fouls than points in his 28:22 on the court. Despite the fact the Nets committed 24 turnovers, the Wizards’ 23 seemed to make all the difference. The Brooklyn Nets (48-33) rested four of their five starters Monday night, yet the Washing Wizards (29-52) managed to come up short with a 106-101 loss at the Barclays Center. John Wall topped the Wizards’ leaderboard with a mere 18 points. Kevin Seraphin, Trevor Booker, Cartier Martin and Garrett Temple each recorded double-digit points for Washington, yet Andray Blatche – of all people – pushed the Nets ahead with his 20 points and 12 rebounds. Washington even shot 53.2% from the field – compared with the Nets’ 46.7% – and went 15-for-20 from the free throw line. Nevertheless, the numbers should have indicated the Wizards 30th win of the season given the fact that Reggie Evans, Brook Lopez, Deron Williams, Joe Johnson, Keith Bogans and Jerry Stackhouse all served as spectators from Brooklyn’s bench. However, the Wizards looked sloppy, turning the ball over 20 times to hand Brooklyn key opportunities, particularly in the second half. Washington started things off on the right foot in the first quarter. Emeka Okafor slammed one in just over three minutes into the game and Martin drilled a three to help Washington to a 16-7 lead. Martin followed up with another just minutes later to give the Wizards a 22-9 boost and, with the help of Temple’s and Seraphin’s jumpers in the final two minutes of the quarter, Washington rode a 13-point lead into the second, up 34-21. But, the Wizards showed signs of wear and tear in the second quarter, thanks in part to Brooklyn’s Kris Humphries, who also recorded 20 points on the night. A.J. Price and Jan Vesely each turned the ball over in the first two minutes of the quarter, redeeming themselves on a joint play to provide Vesely with a basket to keep Washington in front by 12. Unfortunately for Washington, they didn’t do much more and with eight minutes remaining before the half, the Wizards sparked a five-minute dry spell in which only Chris Singleton and Vesely added baskets to Wall’s two free throws. Vesely made another two-point shot with 2:39 remaining and both Temple and Seraphin quickly followed with baskets of their own but Washington closed out the half with just a 56-50 lead. The Wizards held a nine-point lead as late as 9:45 into the third, but Blatche and Humphries helped pull Brooklyn back within four, trailing just 77-73 into the final 12 minutes of play. Washington’s free throws helped keep the Nets in their rearview mirror until Tornike Shengelia followed Kris Joseph’s two free throws with a driving layup to give Brooklyn a 95-94 lead with 4:56 left to play. Booker’s basket just seconds later put Washington back on top, 96-95, but the Wizards handed over one too many foul shots before Mirza Teletovic sunk a three to make it 101-98 Nets. Martin’s three for the Wizards tied things up 101-all with 1:43 remaining, but Seraphin’s bad pass with 1:14 remaining helped Blatche and the Nets to a go-ahead layup. Tyshawn Taylor’s 26-footer provided the icing for the cake as the Nets shut down the Wizards by the final score of 106-101. The Washington Wizards (14-35) shut down the Brooklyn Nets (29-21) Friday night at the Verizon Center in an 89-74 win that showcased what the team has believed in – and many have doubted – since the beginning of the season. The Washington Wizards (4-27) showed reslience and determination Friday night against the Brooklyn Nets (18-15), but they lacked the endurance to power through an additional 10 minutes of play as they fell 115-113 in an intense double-overtime matchup. Heartache is no stranger to Washington. Prior to Friday night’s battle, the Wizards fell by one possession in five of this season’s matchups – including a double overtime loss to the Charlotte Bobcats on Nov. 24 and an overtime loss to the Atlanta Hawks on Nov. 21. And yet, this one topped them all. Whether it was Andray Blatche’s return to the Verizon Center, Bradley Beal’s monster slam in the fourth quarter, Nene’s heroics to send the game into the first overtime or Beal’s buzzer-beater three-pointer to send the game into double overtime, the crowd was riled up as everyone seemed to believe the Wizards had this one in the bag. Sure, the inexplicable chants of “RGIII” erupted. After several of the Wizards voiced their Super Bowl picks via a video message on the jumbotron between quarters, the crowd of 16,006 erupted into “Hail to the Redskins” even after the players returned to the court. But, by the end of the night, something happened at the Phone Booth that has not happened much in the past few months. Fans were on their feet, high-fiving one another and booing the visiting team rather than their own guys who are riding a four-game losing streak yet again. The chants of “Let’s go Wizards!” and “De-fense!” reached a volume far beyond the celebratory cheers when MarShon Brooks’ missed free throws awarded fans with free Chic-fil-a. For the first time in too many Fridays to count, magic was in the air at the Verizon Center and the Wizards seemed on pace to give fans a reason to go home smiling. To start, Nene hit the ground running by notching eight of the Wizards’ first 15 points of the game to give Washington an early lead against the Nets. By the end of the quarter, the Wizards had a 10-point lead and tallied 30 points in the first 12 minutes – tying their season-high for the quarter, set against the Miami Heat on Dec. 4. Although he did not attempt a shot in the entire first quarter, Jordan Crawford went 5-for-6 shooting and posted 13 points towards the Wizards’ 55-53 lead at the half. Despite having led by as many as 14 points in the first half, the Wizards made it evident by the end of the third quarter that they would remain neck-and-neck with the Nets for the remainder of the game. Before Wizards fans could cry “Same old, same old,” Bradley Beal brought the crowd to its loudest volume yet with a monster slam over Brooks with 6:15 remaining. With just over a minute left in regulation, Crawford’s jumper tied the game at 91 apiece before Brook Lopez – who posted 27 points and 13 assists by the end of the night – found the net in time to put Brooklyn up 93-91 with only three seconds left. Then, the Wizards looked to Nene. With help from Garrett Temple, Nene weaved through traffic and sunk a nine-footer to send the game into overtime and to ignite roars from the crowd. Everything seemed set in stone for the Wizards once Martell Webster sunk two free throws to give Washington an eight-point lead with less than 1:30 remaining in overtime. That is, until Keith Bogans sunk a three-pointer, Gerald Wallace responded with two free throws of his own and Deron Williams made a driving layup to put the Nets right back in the Wizards’ rearview mirror, trailing 101-100. Lopez then drew a foul off Nene and sunk both of his free throws, and Emeka Okafor fouled on Williams with just three seconds on the clock, allowing the Nets to take a 104-101 lead. Fans began packing their things – some even headed to the concourse – when Wittman decided to call upon Beal for the long-shot. Crawford passed to Beal who had barely enough time to get the ball out of his hands, yet his 27-footer found the net in time to send the game into the second overtime. Aside from Webster’s two points to start the second overtime, the Wizards trailed throughout the period, thanks to Wallace’s layup and Bogans’s jumper. While the Wizards managed game-changing stops and seemed to avoid getting jammed by the Nets’ defense throughout most of the game, they simply ran out of gas – or magic – in the final overtime as they finally fell 115-113. With the loss, the Wizards are now 0-5 in overtime games and just 3-13 overall at the Verizon Center. They will once again have their work cut out for them as they take on the Heat in Miami Sunday night at 6:00 p.m. ET.